Financial freedom through building Dividend Machines! Many people ask how can they retire from work earlier and be financially comfortable like me? Of course, I tell them investing for income has a big part to play. Often, the next question is whether I could teach them how to invest for income? No, that sounds like work and I am lazy. Bad AK! Bad AK! Well, we have Dividend Machines. Learn how to analyse REITs. First peek into AK's head. 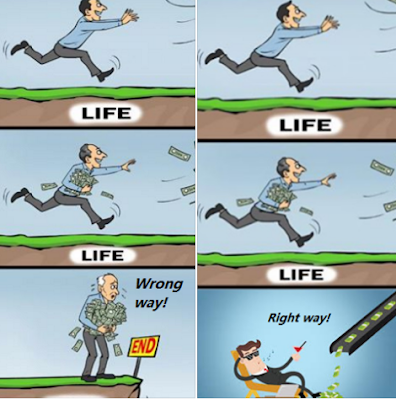 Investing for income consistently and correctly could help us to achieve financial freedom. This is when income received from our investments is enough to replace our earned income or at least meet our expenses in life. Then, we have the option to work if we want to and not because we have to. Second peek into AK's head. I like Dividend Machines because it really helps investors for income shorten their learning curve and it is also great value for money. Don't wait too long to sign up because once this intake is full, it will be another long wait before the next intake. Don't say you should have started investing for income earlier. The best time to start is always now! If you enjoy listening to AK talking to himself, you will definitely enjoy Dividend Machines. If AK can do it, so can you. Dividend Machines for a secure retirement. Cheat sheet sounds like something from an RPG game. LOL. I gave out hard copies of this check list during the "Evening with AK and friends" event last year. For this blog, I took more than 10 shots with my IXUS and this is the best shot. I have been investing stocks for sometime but never into reits, but recently, I have been inspired by u and many others to look into this. suppose I have 200k, should I diversify into 10 or more different reits? Or focus on a specific 3-4 reits? Do u adjust your strategy between a reits and a business trust (e.g. CRT or Religare health)? You have to be very clear what you want as an investor. When we invest in REITs, our focus is on income and whether that income is meaningful and sustainable. I am not going to tell you if you should invest in 10 REITs or 3 or 4 with $200K. It is something that you must decide for yourself. Personally, I invest more in whatever I believe more strongly in and less in what I think are weaker cases. Don't ask me for specifics because they are my beliefs and you should have to form your own. Can i know when are the available dates before signing up? 4,5,18,19 and 25 March and also 1 Apr. dun want to squeeze 80 - 100 people in the room... bad for learning. So it's an online course with a one-day workshop or...? I noticed that there're 6 dates for workshop. Yup, It's an online course with One day workshop. Online course so that even after everything, you can still refer and ask questions. And the course is updated this year too. In fact, we also included a new module on M-Reits if anyone is interested in looking at that. May I know if any seats are still available on 25th march? Would like to check beforehand as I work on weekends and only off on 25th. How many max ppl in class for the live workshop? 25 - 35. Maximum is probably 40.
and the price is in US$ and not S$? a much accepted currency across the globe when it comes to online purchases.